I have a super giveaway for you today, featuring some beautiful rings straight from the folk over at BLUE STEEL! 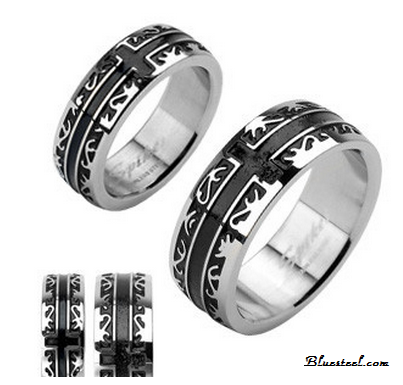 If you haven't yet heard of them by now then you will be interested to know that Blue Steel is a fabulous place to buy all manner of jewelry and boasts a large selection of styles cut in durable STEEL (alongside some more traditional approaches such as sterling silver!). I have often wondered why it is that people edge towards gold so often when I personally am not a big fan of the way it looks, or its durability dependent on carat, but give me a steel piece any day and I am one happy bunny! Just this past week I was lucky enough to see for myself how pretty some of the rings over at Blue Steel could be and am delighted to introduce you to not only the Aqua Paragon, but the Oracle Mega Cross too! The Aqua Paragon is a stunning ring made of steel and surrounded by both aqua and clear CZ stones, which are aqua all around the back and then alternate clear and aqua around the front! This ring is a unisex ring and so delights and man or woman who loves a little bling without being too over the top for either gender! It is .24 wide so quite a thick ring, but I chose this one based on the fact that I wear a size 10/11 ring and have far from dainty hands, which makes this ring perfect for me in particular! Now, while the Aqua Paragon is fabulous for men too, this isn't the style of ring my husband would typically choose and so I picked for him the Oracle Mega Cross, which is a flat band, surgical grade steel ring with a deep black cross that tails all the way around the ring! This ring is durable and outstanding at the same time - just what my husband needs for the job he does that has already once destroyed his traditional wedding ring, which the Oracle Mega Cross does a wonderful job of replacing! But WAIT! This is where it gets EXCITING! The rather generous folk over at Blue Steel are giving you, our lovely audience, the chance to win a $50 gift certificate to purchase anything you like from their site! Alternatively, if you would like to chose the Aqua Paragon, which is a little more pricey than the $50, then they are willing to let you pick that instead! Aren't they fabulous!? And how do you get the chance to win? I hear you ask! Well! That is simple! Just scroll down to the raffle copter and enter as many (or as few) options as you like for a chance to win! The more options you choose, the more chances you'll have to win this wonderful prize!! You may even tweet daily for extra entries!!! You should be over 18 (or have parents permission) to enter this giveaway and reside in the U.S.A. The giveaway will run for 3 weeks in total and end on 5/27/13 with ONE WINNER. The winner will be emailed directly so please provide valid emails for this purpose only! There will be a 24 hour period for the winner to claim their prize and by which time, if no correspondence is held, will be contacted once more for a second chance! If no response is then levied from the winner, the prize will be forfeit and passed along to a new winner and so on, so forth until a winner claims their prize! No entries are mandatory but all are encouraged for more entries! By signing up to mailing lists and websites you are willingly allowing Blue Steel to contact you with current deals/events etc. Mom's Gone Bronson is NOT responsible for the fulfillment of this prize. That falls to the responsibility of Blue Steel. Thank you! What are you waiting for! ENTER BELOW! Disclaimer: I was compensated for this review with 2 rings from Buybluesteel.com and was in no way monetarily compensated for my opinions! My opinions are 100% honest, truthful, thorough and my own! Your views may differ! Thank you and Good Luck! That is a beautiful ring! Thank you for sharing, I've been seeing a lot of reviews on Blue Steel. All have been good. I have to find an anniversary gift for my husband soon, I think I will check it out. I would love a new pair or earrings! 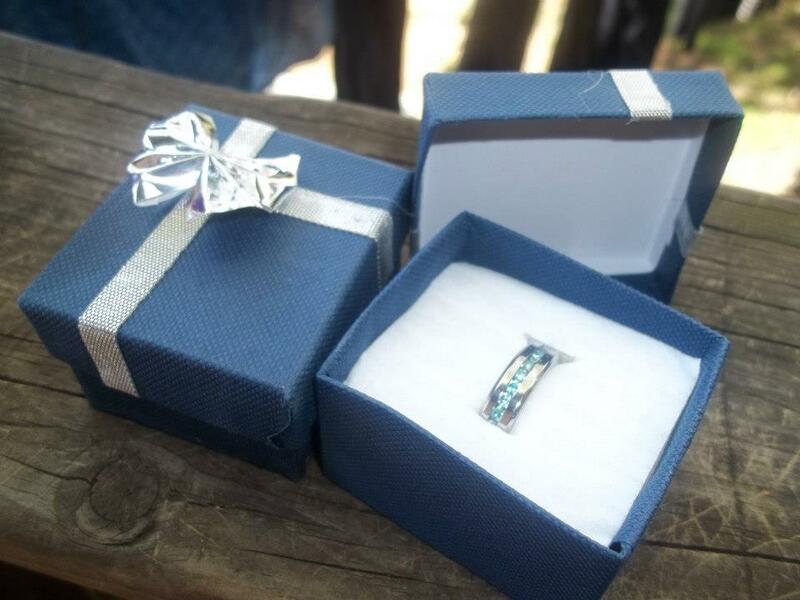 Oh wow what a pretty ring! I might spend (part of) the gift card on the Tiffany inspired coin ring (http://www.buybluesteel.com/collections/rings/products/tire-mark). Love it! Thank you! I would love a new pair of earrings. I like the Evangeline set or the love knots. I would probably get the Clover earrings. I really like the martini ring. I loved this site, thank's for sharing inmportant post. 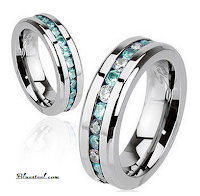 Shop jewelry online for stainless steel rings, earrings, bracelets, necklaces, and more. Great quality, selection, service and prices!